The illegal trade in refrigerants poses a threat not only to businesses and industry but also to end-users, to the environment and to national security. 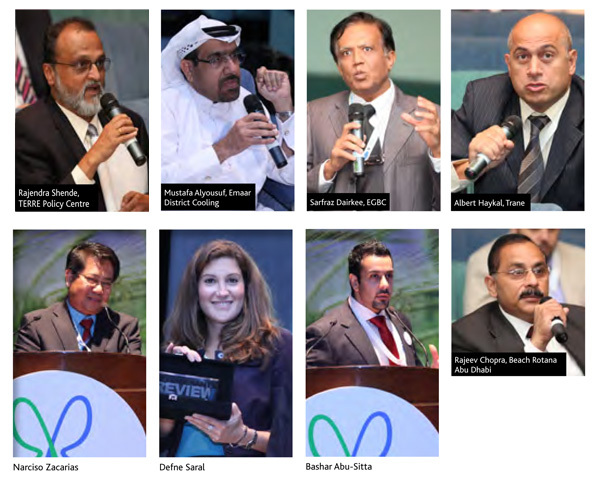 Though relevant entities have been taking counter-steps to reverse the prevailing situation, more needs to be done, was the general opinion at Refrigerants Review 2. In Part II of the postevent report, we focus on the menace of the counterfeit market and containment of refrigerants in district cooling plants. Jerome Sanchez reports. After presentations from key industry personalities, which tackled assessment and ratings of refrigerants and global targets and strategies on the phaseout of HCFCs (see the November issue for in-depth coverage), the second day of Refrigerants Review Round 2 (RR2), held from September 24 to 25 at Jumeirah Beach Hotel, Dubai, and produced by Climate Control Middle East (CPI Industry), to begin with, trained its gaze on the growing illegal trade in refrigerants. The discussion was moderated by Rajendra Shende, former Director, UNEP and Chairperson, TERRE Policy Centre. Ioana Botezatu, International Partnerships Officer, Environmental Crime, Interpol, first took the podium and spoke about the impact of illegal trade. She gave information about the formation and the function of the Environmental Crime Program (ECP). Created in 2009, with participation from Interpol and Chiefs of Police from 190 countries, the ECP was formed to assist member-countries in the enforcement of environmental laws and environmental international and national treaties, she said. Its strategic goals, as Botezatu pointed, was to provide operational support, encourage exchange of information and capacity building and offering opportunities for networking. In addition, Botezatu also spoke about a few of the ongoing projects of Interpol, directed towards environmental protection, including Project EDEN, Project LITE, Project LYNX, and Interpol Environmental Crime Program (IECP). She emphasised that the core function of IECP was to support National Environmental Security Task Force (NEST) and to bring compliance agencies together to maintain environmental security. She believed that the initiative needed more support from government agencies, intergovernmental organisations, nongovernmental organisations and other related sectors, including the business sector. “Illegal trade is not only a threat to environmental security but also to national security,” she concluded. Hatem Fouad Aly, Representative, Head of Office, United Nations Office on Drug and Crime for the GCC Countries, then spoke about the UNODC-WCO Global Container Program. He explained that the Program was geared towards enhancing control over transnational containers and striking a balance between efficient container control and convenient trade and container flow. He emphasised that the Program’s main function was to build intelligence and capacity to increase the efficiency of control over containers, and not to provide best inspection and detection equipment. He added that to facilitate the cooperation and sharing of information among diverse national agencies, the Program also included the Container Control Unit, in which different entities, including customs, courts, and narcotics and organised crime authority participated. Aly revealed that UNODC was looking to use all instruments available to support the cause against environmental and wildlife crimes. “We are trying to work with possible colleagues and specialised agencies to have the most specialised approach to deal with wildlife and environmental crimes,” he said in conclusion. Shedding light on the policies and guidelines for refrigerants in Dubai and the UAE was Narciso Zacarias, Principal Engineer, Air Pollution, Environmental Planning and Studies Section, Environment Department, Dubai Municipality. He highlighted efforts by the Government of Dubai to phase-down the use of HCFCs, including compulsory registration and imposition of quota for HCFC importers and traders, and the issuance of environmental clearance for off-loading imported HCFC. “Importing companies are very smart; they are smarter than the authorities. But regulators must be smarter than them,” was his pithy advice. Zacarias also spoke about the environmental impact assessment, the issuance of a manual on green building materials, products and testing facilities and the ESMA energy efficiency labeling system. In his opinion, the environmental impact assessment was at a voluntary stage until 2013, and would become mandatory from 2014, as part of the Dubai Green Buildings Business Strategy. He believed that the manual would help the end-users make sure that the materials that they used and their testing facilities were certified or accredited as per the requirements of the Dubai Municipality. As for the ESMA energy efficiency labeling system, he said that it would employ a star-rating system based on the equipment’s energy efficiency ratio. In a joint presentation, Defne Saral, Head of Sales, Fluorochemicals, Europe, Middle East and Africa, DuPont Chemicals and Fluoroproducts, and Bashar Abu-Sitta, Sales Manager, DuPont Middle East, spoke about DuPont’s global effort to combat counterfeiting of its refrigerants. “Counterfeit refrigerants pose a global threat, can be unsafe for use, and can pose quality issues for businesses and customers,” Saral said in her opening remarks. She highlighted that a study conducted by DuPont to ascertain the frequency of counterfeiting and illegal trade revealed that in the Middle East alone, more than 30% of their customers had been exposed to counterfeit refrigerants. She then touched upon DuPont’s refrigerants brand assurance anticounterfeiting global initiative and emphasised that customs officials and customers were being trained to spot fakes, to be familiar with the packaging and sizes of the genuine products, and to be knowledgeable of DuPont’s supply chain and standard procedures. Abu-Sitta, then, took the podium and spoke about DuPont’s Izon hologram labeling stickers. He illustrated that viewed from different angles, the hologram sticker would show dots of different pre-determined numbers. “Count the dots and count on DuPont,” he said, succinctly summing up the dot-counting system employed by the company. In Abu-Sitta’s opinion, the Izon security stickers would simplify the identification of authentic products as the label would always be positioned on the top of the containers for easy visibility, and could not be removed without damaging the label itself. He ended his talk by announcing that their efforts in Dubai, in collaboration with the government and federal authorities, were yielding positive results. “Counterfeiting is a global problem that no one company alone can combat. Everyone in the value chain has an important role to play,” was his verdict. Towards the end of the session, a short open forum was held, moderated by Shende. (For highlights, see Box 1:Snippets.) Tackling containment of refrigerants in district cooling plants and technology and application of absorption chillers was the topic slated for discussion on the last session of RR2. The session was moderated by Yaqoub Al Matouq, Refrigeration Expert, Kuwait National Ozone Committee, Environmental Public Authority. First to speak about the containment of refrigerants in district cooling plant was Fadi Hachem, Design Manager, DC PRO Engineering. He began his presentation by highlighting that district cooling had the lowest leakage rates in the refrigeration industry, owing to the industrial grade control systems that could help monitor and control leaks at the central station, rather than having scattered plants or multiple units. “Sadly, district cooling penetration in the Middle East is disappointing,” he pointed out, explaining that district cooling facilities in the UAE did not exceed 10%, while the same was lower at two to three per cent for other GCC countries. He went on to speak extensively about ASHRAE 147-2002 (Reducing the Release of Halogenated Refrigerants from Refrigerating and Air- Conditioning and Equipment Systems) and how it was a response to the potential link between release of refrigerants and the depletion of the stratospheric ozone layer. It needs to be noted that the abovementioned standard establishes practices and procedures to minimise leakage from equipment during different stages, including design; product development; manufacture; installation; service, operation and maintenance; and refrigerant recovery, re-use and disposal. Hachem listed guidelines to minimise leakage in district cooling plants. (For details, see Box 2: Pointers to minimise leakage). In conclusion, he spoke about the advantages and disadvantages of using ammonia as a refrigerant, and presented a study on its application at Heathrow Airport Terminal 5 in London. The last speaker of Round 2 of Refrigerants Review was Hajime Yabase, Deputy General Manager for Engineering and R&D, Kawasaki Thermal Engineering Company, Japan. In addition to highlighting the history and advantages of absorption chillers, he spoke extensively about triple-effect absorption chillers, saying that they have the highest efficiency and reduction in CO2 emissions, based on their studies. He also discussed solar cooling, pointing out that the process was suitable for all areas where solar energy was abundant. The conference concluded with a panel discussion on the best practices for the responsible use of refrigerants, safeguarding the environment, preventing leakages, minimising direct and indirect emissions, and the feasibility of using natural refrigerants in a district cooling plant. Tariq Al Yasi, Chief Operations and Maintenance Officer, Empower, and Farhan Juratli, Project Manager, District Cooling, Nakheel PJSC, joined Hachem and Yabase for this part of the programme. (For highlights, see Box 3: Parting shots). Refrigerants Review Round 2 provided an excellent opportunity to better understand the issues surrounding the HVACR industry. Different views and divergent opinions were expressed on the discussion table during the event but common key points resounded throughout the conference: that there are different refrigerants suitable for different applications, that the dangers of counterfeit refrigerants transcend national boundaries, and the interest of environmental guardianship looks beyond any commercial or personal consideration. Fadi Hachem listed several key points to minimise leakages in district cooling plants. The best way to minimise refrigerant leakage is by minimising refrigerant charge and system cooling capacity required. Follow green building and efficient design codes, avoid over-sizing, and use renewable energy, heat recovery and absorption chillers where possible. A refrigerant leak detection and monitoring system must be installed in large refrigeration plants for early detection of refrigerant leaks. All equipment, components and complete systems should be leak-tested, cleaned, dried, evacuated, charged with dry nitrogen in accordance with ASHRAE Standard 15 and sealed prior to shipment to ensure leak-tight equipment. During commissioning and startup, equipment should be leak-tested in accordance with manufacturers recommendations to ensure leak-free installation. Servicing of refrigerating equipment should be undertaken by properly trained personnel. Early leak detection can save the environment and owners significant costs associated with full loss of refrigerant charge.